The demand at local shelters and aid organizations has gone up as temperatures drop this winter. As temperatures fall, groups focused on keeping people sheltered, clothed and fed are feeling a higher demand for support that they don’t always get. Randy Reynolds turns to Carmichael Outreach this time of year to gear up for a long, cold winter. “I (have) got warm gloves, and boots and things like that,” Reynolds said. But at the moment, pickings at Carmichael Outreach are thin. Carmichael has put out a call to the city in hopes of getting donations as the cold weather sets in. 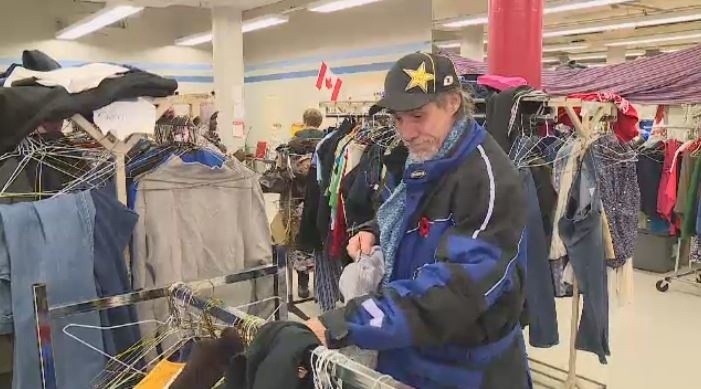 “We are looking for warm winter jackets, as well as things like socks, gloves, toques, things like that,” Berenyi said. Mobile Crisis held a winter clothing drive on Friday to fix a similar problem it has been having. The group’s needs extend beyond clothing, as they’re seeing an increase in demand for shelters, beds and meals. Carmichael Outreach says it typically sees donations drop off towards the end of the winter. It’s hoping to see people donate from the start to the end of the cold season.